The plot as I said was quite simple. 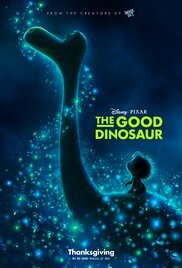 It tells teh story of if teh asteroid had NOT extincted the Dinsaurs 65million`years. Mama and Papa are doing farming by means of their back etc., and of course the tails. It tells teh remamrekable story of how an APastorairus meets the human “scritter” Spot. So Arlo is part of a family of Momma(McDormand), Poppa(WRight), Children include: Arlo(Ochoa), BUck(Scrbiner) and LIbby, Arlo goes throguh lifes ups and downs. ARlo being the odd ball int eh family. This entry was posted in Movies and tagged animation, movie review. Bookmark the permalink.